I couldn’t tell you how many times I’ve sat alone, ruminating on my past or future and wondering if everything would truly be all right. Those clawing thoughts seem to latch at the base of your skull, whispering all your fears until you start to believe you don’t have the strength to overcome them. I’ve long struggled with depression and agoraphobia—mainly from failing to find that oh-so-straight path leading towards happiness—but every time I stood at the edge of the abyss, staring into that deep darkness across the precipice, I heard a voice in the pit of my soul. It was still, feminine, calling the words, "We can do everything over." Most would refer to Sailor Moon as girly tween pop, and after an original 200-episode anime, multiple musicals, and a second manga-based anime, they would be right. The anime is indeed filled with rainbows and girl power. This aspect isn’t bad in itself. To the contrary, it inspired many young American girls such as myself to be strong and proud of ourselves, as the culture of anime made a surge into the United States in the mid-90s. I however am referring specifically to the manga, the story written and illustrated by creator Naoko Takeuchi. The manga is a darker story. While also filled with glittering transformations, heart-shaped talismans, and talks of idols and boyfriends like the anime, the overall content has serious undertones. Unlike the animation, villains are impaled, sliced apart, and melt away in gruesome scenes of decay. Issues of trust and infidelity, body image, loss and death, destiny and purpose are explored. Each Sailor Guardian is more independent, more complete as an individual, yet they are uniquely tied to one another. There are intimate connections within the group, including a lesbian relationship between Michiru (Sailor Neptune) and Haraku (Sailor Uranus), and a strong bond that unites all of them like a family. One could even argue themes of polyamory appear as well, especially given the final marriage scene in which all the Guardians are wearing wedding dresses, as if to say they are marrying one another. Details aside, they are ruthlessly devoted to one another while striving to overcome their respective flaws. While many of these elements are touched upon in the anime, Naoko approaches them with grace, respect and realism. These aspects give the manga depth beyond the teenage angst and girly motifs of the animation. "We can do everything over," is spoken in the final volume of the series by Sailor Cosmos, the ultimate future version of Sailor Moon. There are multiple moments of triumph and growth in the series, but the moment Sailor Moon sacrifices herself at the end, leaving her future-self behind, is the most crucial. Cosmos is from a distant future where war has raged so long, even victory would mean nothing in the face of the devastation it has cost. Cosmos believes that if she returns to the past, to the moment where she met the origin of evil at the Galaxy Cauldron—the place where stars, planets and souls are born—she could stop the evil from growing and prevent the war. Cosmos returns to her past disguised as a young girl. Speaking only a few words, she cozies up to Sailor Moon, intending to help her choose the correct path this time around. When she and Sailor Moon finally make it to the Galaxy Cauldron, she instructs her past-self to destroy it, but Sailor Moon realizes that even if she destroyed the Cauldron, conflict would continue. A new Cauldron would be born, and life would start anew. The price of living, hope, and love are death, war, and suffering, and Sailor Moon tells Cosmos that this is okay. Sailor Moon sacrifices herself to defeat the evil by diving into the Cauldron, leaving Cosmos behind at the edge. Cosmos realizes that she had already made the right choice. She faces her past mistakes in ways the rest of us can only dream and astonishingly makes the same choice again knowing full well what it will mean for the future. Sailor Moon defends this way of life—that of balance and equilibrium. The value of joy is only as strong as the weight of pain. The state of the universe cannot be changed, and no matter how bleak the future may appear, "We can do everything over." 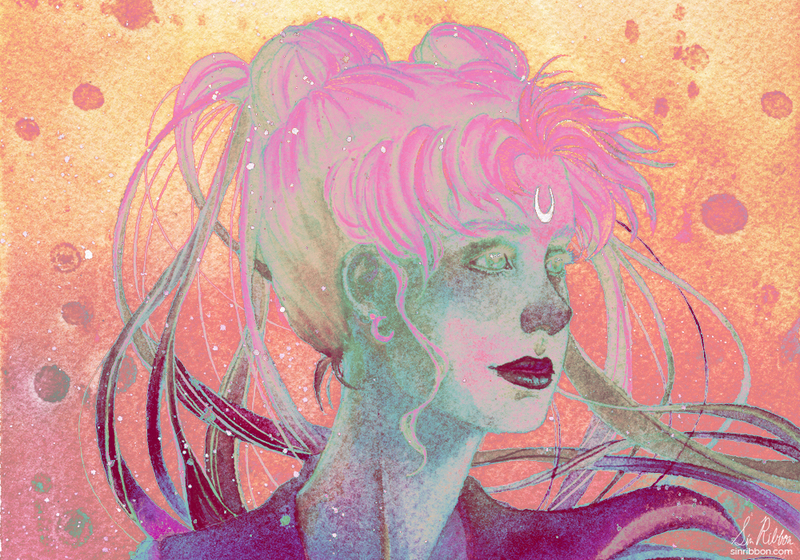 Before Sailor Moon dives into the Cauldron, she tells Cosmos, "As long as stars shine, we’ll be okay. We won’t lose." They’re words I keep with me. The worn spines of my volumes are a testament to all the nights I contemplated my own choices and if I would make them again now knowing their cost. The greatest comfort in Naoko’s message is believing that, no matter how much I doubt my ability to create my own happiness, a part me remembers that I can start again. Cosmos returns to the future and Sailor Moon finds her soul reformed in the Cauldron, eventually making her way back to the Earth, but with the knowledge that the evil was not fully defeated. Back on Earth, Moon tells her lover that she felt as though she was watching a long dream to which he asks, "What about?" "I forget," she replies. Perhaps all of us feel the longing of the stars, the journey, the need for a circle of companions so close their hearts were ours, and perhaps we’re all struggling to remember what it is like. Even in the face of that emptiness, we can build our own futures.